This easy-to-use & affordable spectrometer is perfect for Astro 101, physics, or chemistry classrooms! Its live video display engages students with real-time colorful gas tube spectra & intensity graphs. Great for demonstrations & hands-on labs. There’s virtually no learning curve: just plug it in, launch the included RSpec Explorer software & point the camera at a light source. Students will be captivated by the live display. 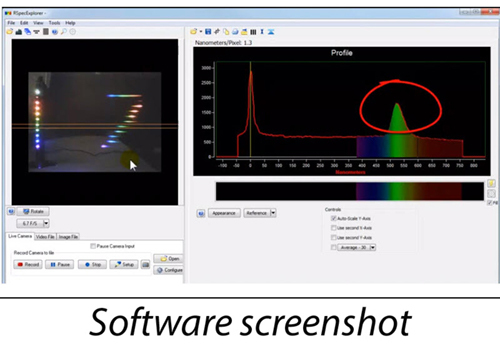 This system makes teaching spectra a pleasure because everyone sees the same thing. 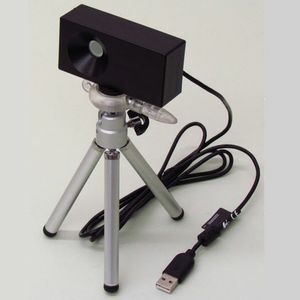 Includes spectrometer with internal video camera, tripod, and one license for the RSpec Explorer software. The single license allows for software use on more than one computer (e.g. multiple equipment carts, podiums, educators’ computers, etc.). The hardware comes with a one-year limited warranty against defects in manufacturing. The software comes with one year of free updates and support. Price includes shipping for locations within the continental U.S. Product is drop-shipped. For shipping to other locations, please contact customer service. NOTE: Promotional codes are not valid on this product. ASP member 10% discount still applies.